A Blue Origin rocket has now made four trips to space. The private space company headed by Amazon (AMZN) CEO Jeff Bezos successfully landed the same Blue Shepherd rocket again Sunday after an unmanned test flight from its launch site in West Texas. Blue Origin wants to pioneer space tourism by offering paying customers a ride to what's known as suborbital space, reaching about 62 miles above Earth's surface. It plans to make the first trip with passengers in about two years. The company made another leap toward that goal on Sunday by crash testing the portion of its spacecraft intended to carry people. 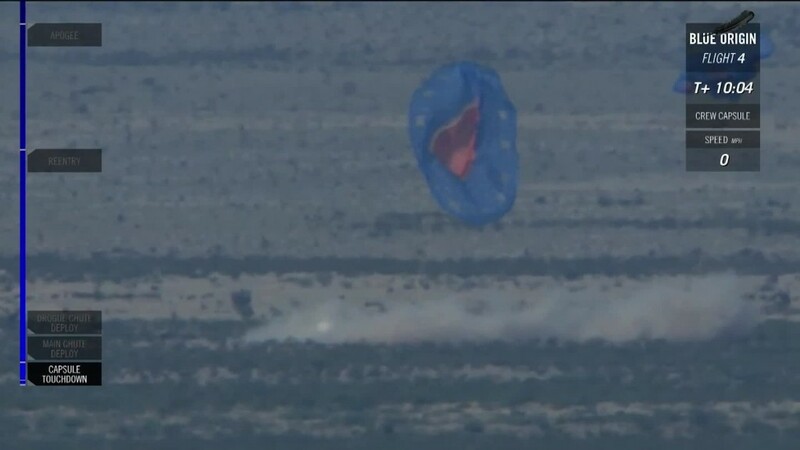 The capsule landed safely even though one of its three parachutes intentionally malfunctioned upon descent. Bezos is among several high-profile executives -- like Tesla's Elon Musk and Virgin's Richard Branson -- looking to make space travel cheaper by getting the private sector involved. The ability to land and reuse rockets is a major step toward that goal. "Traditionally, companies spend millions of dollars and many man hours building a new rocket for every single flight," Blue Origin business and development strategist Ariane Cornell said on the company's first-ever live webcast of the launch Sunday. "We spend just a mere fraction of that refurbishing this rocket. We're talking about low thousands of dollars." Cornell added the rocket is designed to allow Blue Origin to launch "at least 50 times" for the price of building one new rocket. Blue Origin and Musk's SpaceX have both executed multiple rocket landings over the past year. SpaceX has even landed two rockets on a remotely piloted seaborne platform after launching missions destined for distant orbit. The company plans to launch one of its refurbished Dragon rockets for the first time this fall. In the past, Musk and Bezos have traded competitive barbs on Twitter. On Sunday, Branson -- whose Virgin Galactic is seeking to compete with Blue Origin in space tourism -- wished Bezos "Good Luck" ahead of its test flight. "We'll be cheering for you. Space needs all of us," Branson posted on Twitter. To which Bezos responded: "So agree." Neither Musk nor SpaceX had weighed in on the Blue Origin launch on Twitter as of Sunday afternoon.